Networking. What comes to mind when you hear the word? Most people you ask that question to will probably have different answers for it. In today's job-hunting practices, networking is an essential component in making the necessary connections to get recognition in your desired field. Doing it effectively and knowing where to begin is a challenge that many job seekers face. The following tips will guide you in your efforts to begin meeting valuable acquaintances and build on your professional endeavors. Networking doesn't have to be focused on tactics to get people to notice you. 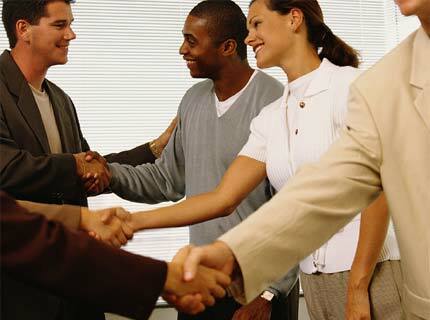 Networking should retain its natural sense when meeting new people and ultimately be fun. You're not meant to find your new best friend but rather feel similar to when you meet new classmates or coworkers. You all share a common interest and that's where your focus should rest on. What is your objective? Before you start reaching out to people you need not only a game plan but to have clearly defined what you want to get out of your networking campaign. Then, think about the areas of people--including their positions--and companies you want to reach out to. In order to get others to have a clear idea of your purpose, you have to be the one to make it clear first. Doing this will also prevent you from reaching out to people that you're unlikely to follow-up with and have that make you look bad. The easiest way to make new connections is through the ones you already have. The bonus of this is having that mutual connection from the get-go which adds solidity to your network. If you don't have any connections in your desired workplace, you'll want to start by getting in touch with the manager of that department. Send them an email, phone them, or find them on LinkedIn or Twitter. By meaningful, your correspondence with your networks should serve your ultimate purpose. Don't try to butter them up or make small talk that is unrelated to business. Get to the point--if you're introducing yourself to someone for the first time explain why you're reaching out to them and what you'd like to come of it whether it be a meeting or information on another possible connection. Be as nice and professional as possible as you'll want to keep these connections for the long haul. From there, the rest is in your hands. Calculating each step of the way while networking defeats the whole idea of keeping it natural. It's something to get your foot in the door by seeking out the help and knowledge of others. Networking is a people business. Essentially, you're adding yourself to a professional community that you can always continue to build on. Each person is a resource and should be regarded as a valuable asset in advancing your career goals. Be personable and exhibit transparency. People will offer a helping hand to those who are sincere and honest.